How many classmates can cram into a photo booth? These photos inspired a poem I wrote and will read this evening in Northfield. Minnesota Prairie Roots file photo. AS I PREPPED for this evening’s poetry reading at Content Bookstore in downtown Northfield, my husband asked how many poems I’ve had published. Good question. I don’t know. But my guess would be forty. With 10 minutes to read my work, choosing poems proved difficult. I narrowed it down to six that I particularly like and that are fun to read aloud. And that fit within my time limit. From an especially painful memory of my son being struck by a car in 2006 to a recap of my 40th high school class reunion to a conversation in a grocery store parking lot, my poems reflect a range of topics. I aimed for that. My poem initially published in In Retrospect, The Talking Stick, Volume 22, an anthology published by The Jackpine Writers’ Bloc based in northern Minnesota. The same poem was then selected for inclusion in an artsong project by Rochester musician David Kassler. He wrote music for my poem which was then sung by a Chamber Choir. Minnesota Prairie Roots file photo. Early on in my poetry writing I tended to write a lot of “place” poems set in my native southwestern Minnesota prairie. I’ve expanded beyond that narrow subject now, although the prairie can still claim credit for my writing style. I write with detail. Not just visual, but detail that engages every sense. The starkness of the prairie causes one to notice everything. The howl and bite of the wind. The warmth of soil black as a night sky. The smell of rain and of barn. The taste of sunshine in a garden-fresh tomato. In 2012, artist Connie Ludwig, right, created a painting (left, above my head) based on my poem, Her Treasure. Minnesota Prairie Roots file photo 2012. In my poem Her Treasure, which I will read this evening, I honor all the farm women who labored upon the land by planting and harvesting from vast gardens. I honor, too, my hardworking mom in Ode to My Farm Wife Mother. That poem published in the 2017 issue of Oakwood Magazine, a literary journal printed by South Dakota State University. The setting for The Talking Stick book release party in 2017, Blueberry Pines Golf Club. I’ve been published in this Minnesota anthology numerous times winning honors for my poetry, fiction and creative nonfiction. Minnesota Prairie Roots file photo 2017. I am honored and humbled to have my award-winning poetry published in a variety of places: The Talking Stick, Poetic Strokes, Lake Region Review, The Minneapolis Star Tribune, Mankato Poetry Walk & Ride, Oakwood Magazine, Roadside Poetry Project, Poet-Artist Collaboration at Crossings at Carnegie, Image & the Word, The Lutheran Digest, Minnesota Moments magazine and probably some other places I’m forgetting right now. My poetry is down-to-earth understandable. I’ve always written that way. If you live near Northfield, please join me and four other Faribault area poets at 7 this evening as we share our poetry. And, please, introduce yourself. I’d love to meet you. 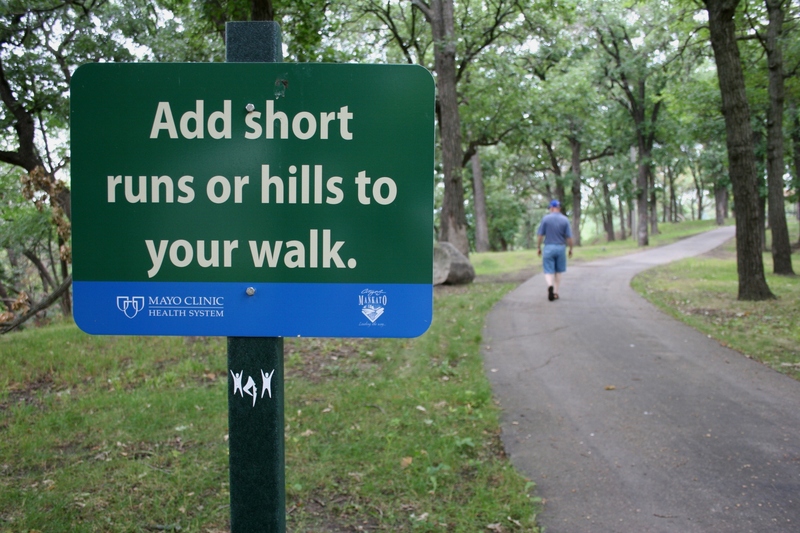 HOW, EXACTLY, WERE WE going to locate a poetry sign in sprawling Sibley Park? 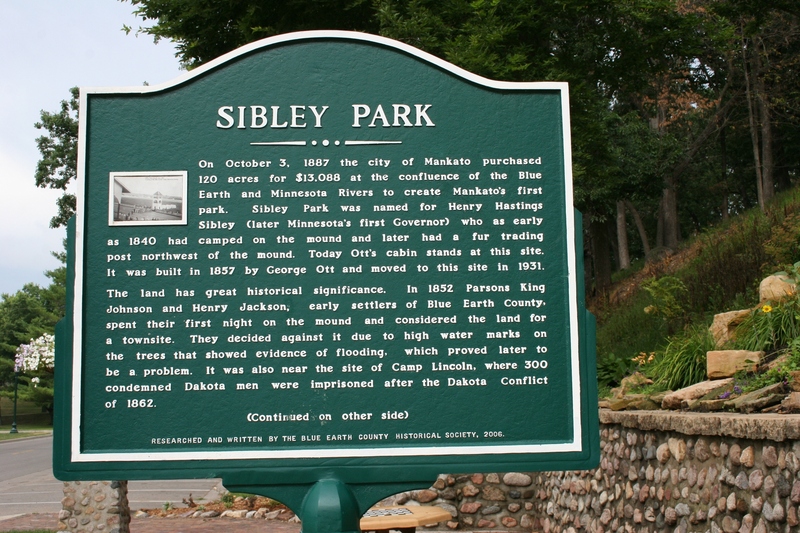 A sign explains the history of Sibley Park. Upon entering this Mankato city park on a recent Saturday morning, I considered that my husband and I would be searching for the proverbial needle in a haystack. We had no idea the park was so large. 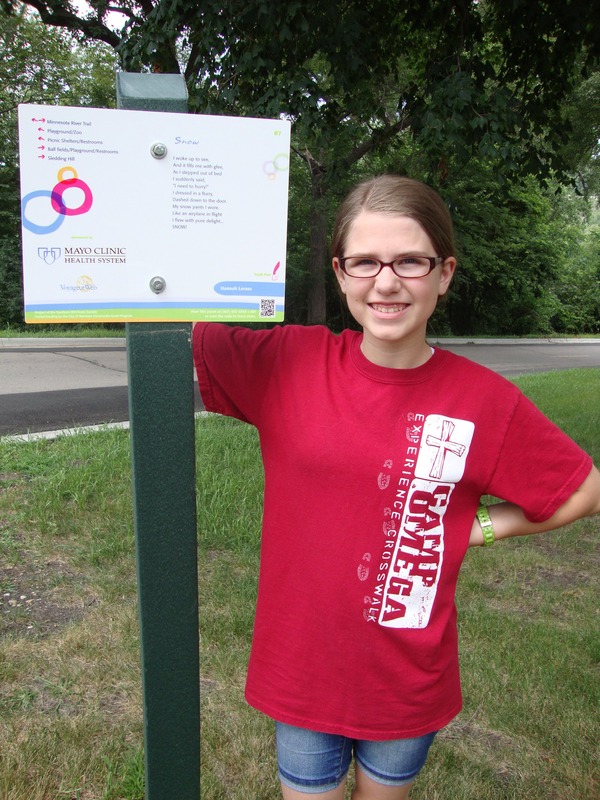 And we were supposed to, somehow, find 12-year-old Hannah Leraas’ Mankato Poetry Walk and Ride sign board here. Yeah, right, I thought as we parked near a stunning flower garden to begin our search because it seemed as good a place as any to start looking. 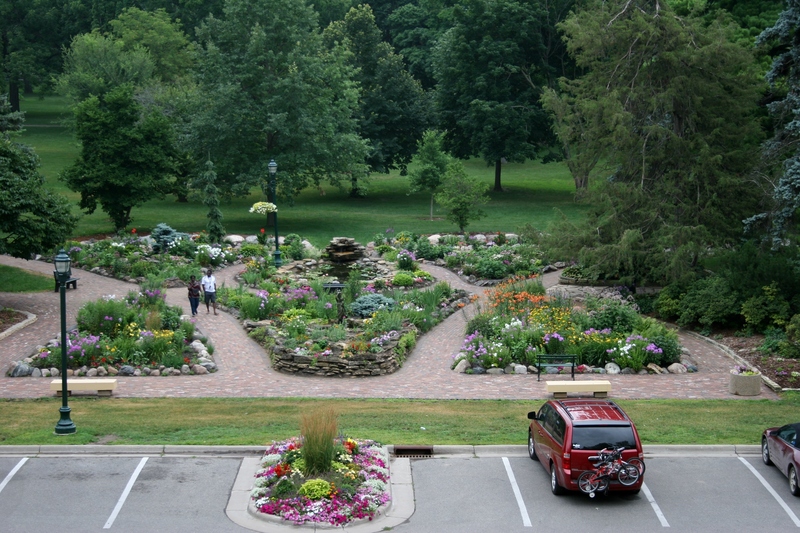 The garden includes water features tucked among the flowers. But I quickly deduced if we were to find the poem, we best ask someone familiar with the park. That was not the young woman on a skateboard. A wedding photographer on his way to a shoot proved more helpful, directing us toward a particular street we had yet to locate in the twisting maze of park roads that are not particularly well-marked. There’s Hannah’s poem, up the hill from the Ott cabin, to the right in the background. Hannah Leraas with her winning poem, “Snow.” Photo courtesy of Leraas family. With his directions and after touring the gardens, we climbed back in the van and moments later spotted Hannah’s poem, “Snow,” just up the hill from the 1857 Ott log cabin along a recreational trail and near CHS Pergola Way. 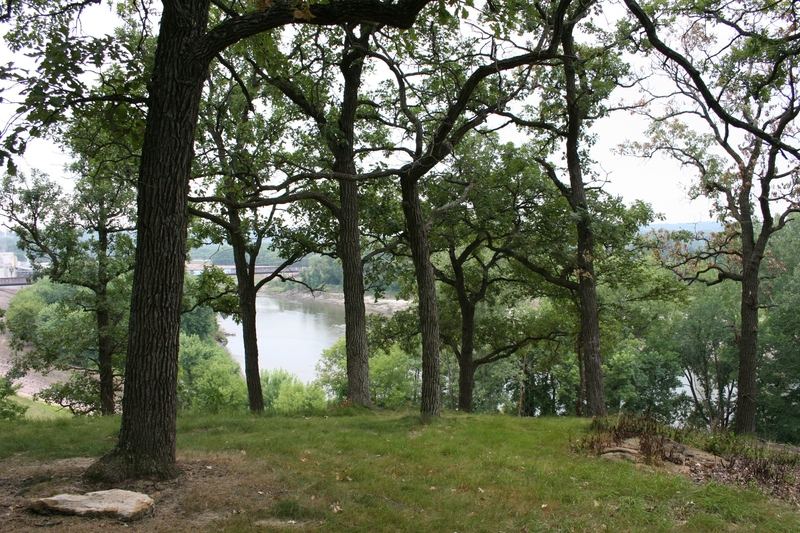 Sibley Park rests at the confluence of the Blue Earth and Minnesota Rivers. The park has many features, including softball fields, a sliding hill, picnic shelters, a zoo (which we did not have time to visit) and more. For any writer, no matter your age or experience, there’s a certain satisfaction in winning a contest and getting your work published. I am grateful for the opportunity I’ve had the past two years to be part of the Mankato Poetry Walk and Ride. 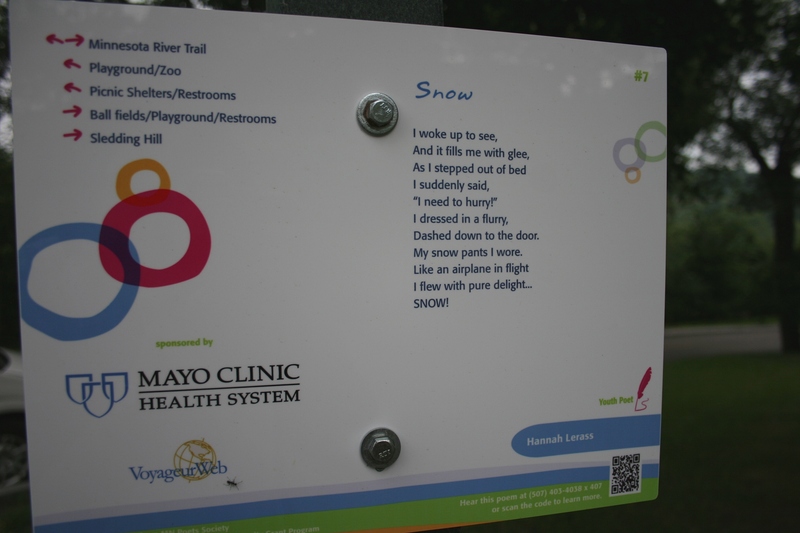 This year 35 poems by 22 writers are posted in parks and along recreational trails in Mankato and North Mankato. Additionally, poems by three notable area poets are featured. 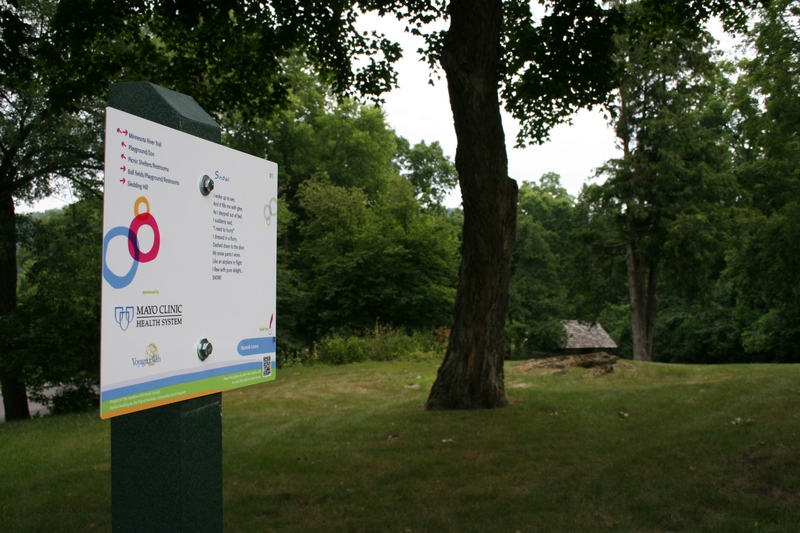 This sign near the CHS Pergola and atop the park’s hill, encourages physical activity. 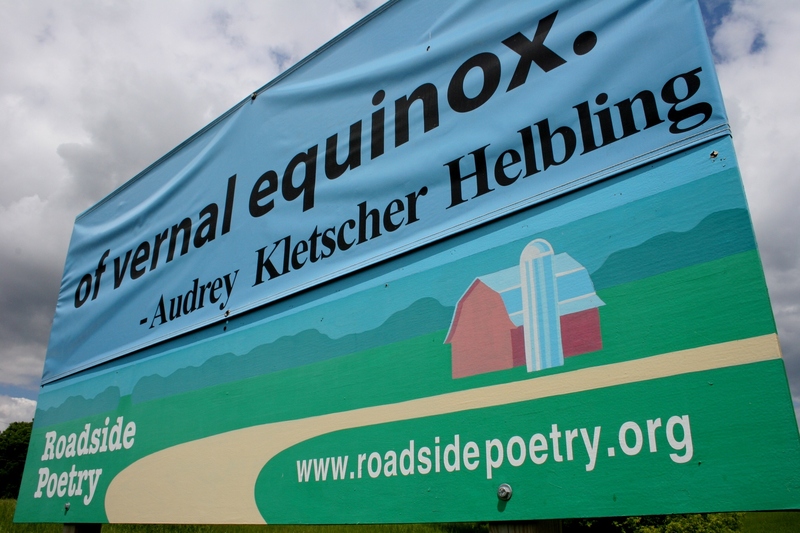 I hope you’ll take the time, if you’re in southern Minnesota, to check out the Mankato Poetry Walk and Ride. Just allow plenty of time for exploring, like we did in Sibley Park, once we found Hannah’s poem. 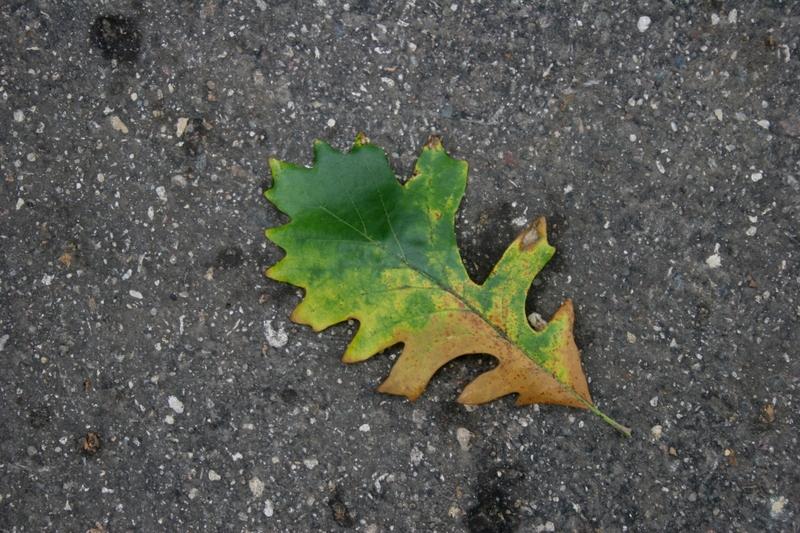 My husband and I noticed lots of oak leaves fallen from trees and oaks that appeared diseased. 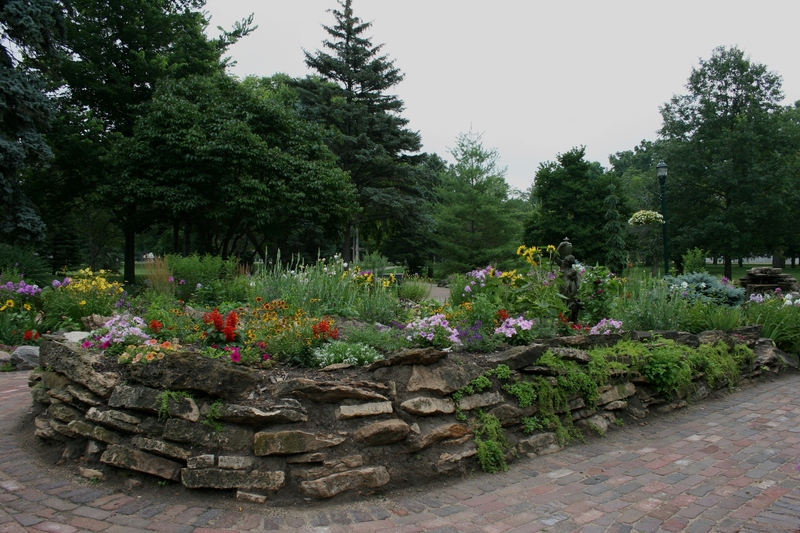 FYI: For more info about the Mankato Poetry Walk and Ride, a project of the Southern Minnesota Poets Society, click here. The lake side of the Hackensack Lending Library. To the left stands Lucette Diana Kensack..
SEVERAL SUMMERS AGO while vacationing in northern Minnesota, my family stopped in Hackensack, 50 miles north of Brainerd. 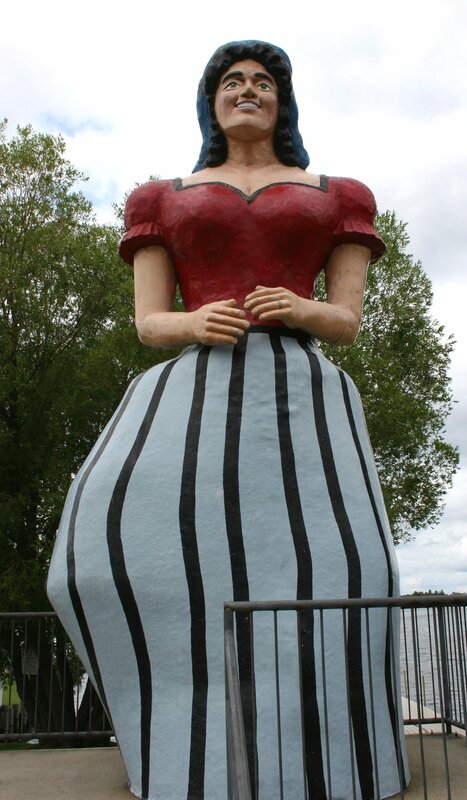 The initial draw to this town of 285 was the 17-foot tall statue of Paul Bunyan’s sweetheart, Lucette Diana Kensack. I appreciate kitschy roadside art. What can I say? Two other discoveries, however, trumped seeing Lucette. 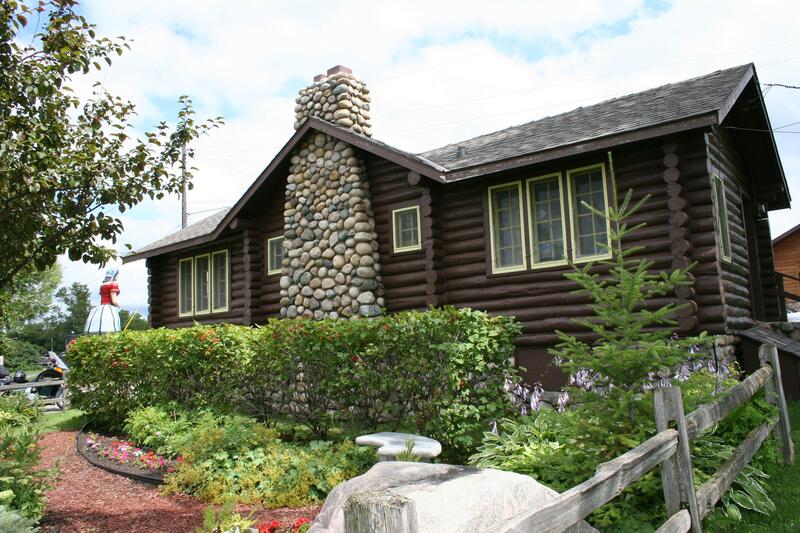 A stone’s throw from Lucette, along the shores of Birch Lake, sits the cutest log cabin—a Works Progress Administration project and today home of the Hackensack Lending Library. 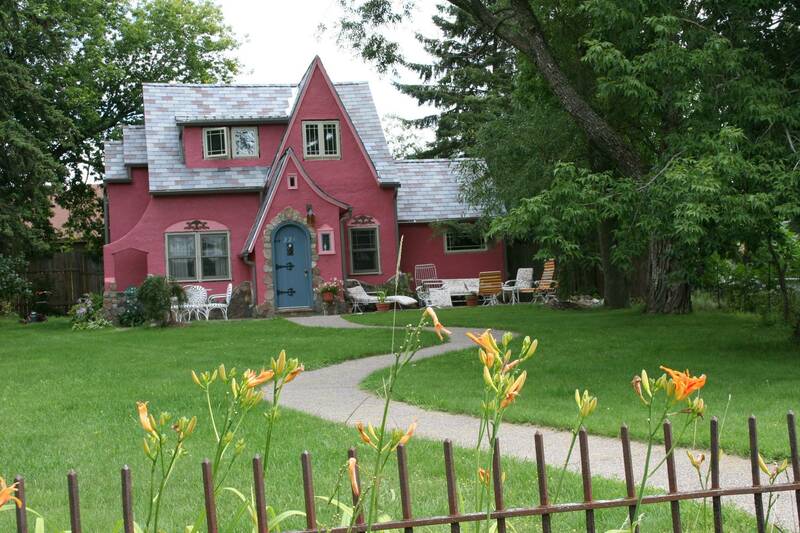 And just down the street from Lucette and the library, I found the sweetest pink fairy tale cottage. Those small-town treasures marked my introduction to Hackensack. Now, fast forward to last summer. I wasn’t back in Hack, not physically anyway. Rather my poetry was among poems displayed at the town’s annual Northwoods Art and Book Festival. During that event, the featured poets are invited to read their poetry. Fest-goers can also vote for their favorites with six poems selected for “Popular Choice” awards. Six poems are also recognized as “Poems of Merit.” All of the original and unpublished poems are posted without author names attached. I didn’t attend last year, didn’t win and didn’t deserve to win. My poetry wasn’t worthy of an award. This year my poetry is back at the Northwoods Festival set for this Saturday, August 20, and I’m more confident that I’ve actually written poems that could win an award. Oh, I’d love to tell you which poem is mine (or it could be both poems that I submitted; I haven’t been told). But I won’t unfairly sway the voting. Suffice to say my rural background shines in my writing. If Hackensack wasn’t such a long drive from Faribault, I’d be there taking in the poetry, the art, the music, the book-signings, the food. 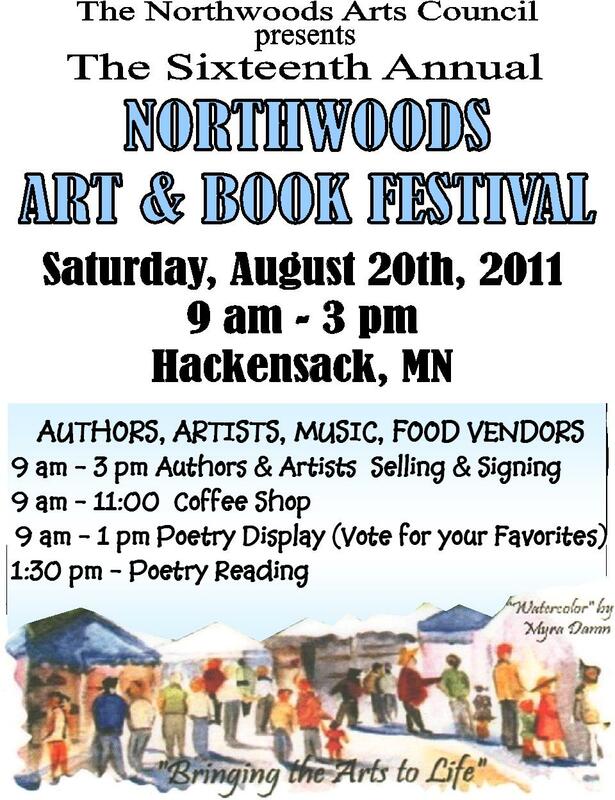 However, if you’re in the Brainerd lakes area or parts north on Saturday, check out the Northwoods Art and Book Festival from 9 a.m. – 3 p.m. and then tell me all about it by submitting a comment. Voting for the “Popular Choice” awards begins at 9 a.m. and closes at 1 p.m. If you’re already thinking, “Audrey, I don’t like poetry,” rethink your thinking. I promise you that my poetry rates as down-to-earth, understandable and not at all stuffy. This whole concept of getting poetry out to the public via a display like the one in Hackensack pleases me. Just like the Roadside Poetry billboards in Fergus Falls. I was fortunate enough to win the spring competition and have my four-line poem plastered across four billboards there. These new poetry venues, and the increasingly popular sidewalk poetry in cities like St. Paul, Mankato and now Northfield, are bringing poetry to the people. That’s a good thing because, in reality, how many of us actually pick up a book of poetry for leisure reading? Minnesota poet Todd Boss and designer/animator Angella Kassube are also making poetry even more appealing by utilizing visuals in their acclaimed motion poems. Click here to read some of those. Poetry has certainly evolved through the years, a necessity to keep writers interested in writing it and readers interested in reading it. The sweet fairy tale house in Hackensack, located near Lucette and the park and photographed in 2009. 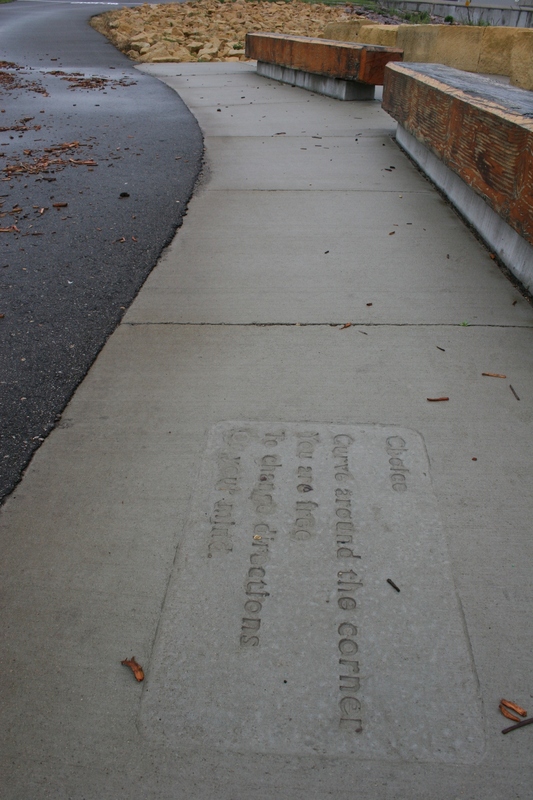 "Curve around the corner/You are free/To change directions/Or your mind," reads this poem by Marlys Neufeld of Hanska and imprinted in a Mankato sidewalk. HOW DO YOU FEEL about poetry? Do you read it? Why or why not?